Tasting Notes: Earthy, rich, indulgent, sweet. 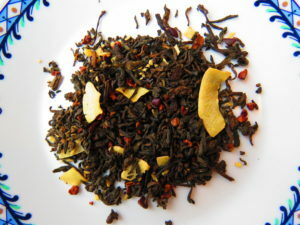 Ingredients: Organic loose leaf Pu- Erh tea, organic cocoa nibs, organic coconut pieces. Dark chocolate pu’erh with flecks of coconut shavings sprinkled throughout! Earthy pu’erh, rich dark cacao nibs and creamy coconut, a luxuriously deep pu’erh blend! Dried coconut makes an excellent partner for deep, dark, earthy pu’erh- and the cocoa, though mild, just adds a wonderful light sweetness to this otherwise dark blend. Pu’erh tea is aged and fermented, making it pro-biotic and an amazing aid for weight loss, the helps boost your immune system, and has been prized in China for centuries. This robust brew can withstand multiple infusions.